Pax Magna Carta! Hooray World! by Lynden R.C. Rodriguez, OCDS The members of the Magna Carta Project at WikiTree.com are entering the last and final leg of the project. It is a race against time to get all of the hereditary connections between the over 200 Gateway Ancestors that immigrated to the New World, connected to the Magna Carta Surety Barons that made King John sign the Magna Carta at Runnymede, England. The 800th Anniversary is June 15, 2015. The Anniversary is not just for Britain, and the United States, but the whole world. It is a vital piece of world history, and an origination document that was, and still is, a major forerunner of the Mayflower Compact and the Declaration of Independence. All three documents are the envy of the world, and many countries have incorporated part, if not all into their constitutions. This list also includes Russia. Unfortunately, not all world constitutions are enforced equally. But Pax Magna Carta! Hurray World! To give a short view of the situation, one needs to have a little lesson in American History; and no, this will not be boring. When Great Britain began to colonize the New World, it colonized not thirteen, but over 75. So, why were these thirteen colonies rebellious, and how did they hold together to become a nation? These were very diverse groups, from New England to the Southern Colonies. Also bear in mind these same differences were to later erupt in the American Civil War. There were often as many reasons for migrating to the New World as there were individuals that moved there. Many of these people may not have thought of themselves as colonists, or that they were doing anything unusual. These were just seeking a way to make ends meet. They may have had means, very good means at that, but there were still reasons why they left the Old World and England in particular. The colonists were many times from very good families, many of them descended from Royalty; but for usually economic reasons, they emigrated from Great Britain. One prime reason given for immigration was because people were seeking freedom to practice their region, and be free of government interference. Another underlying reason may be given to the practice of primogenitor, the giving of all goods and properties to the eldest son, or sometimes daughter, and leaving the other children without and having to fend for themselves to make their own livelihoods. In an earlier article this writer spoke of those Magna Carta Barons who forced an unreasonable monarch to sign a reasonable and democratic document. But at the time the English began to people the North American Atlantic seaboard, no one was thinking about the Magna Carta, but of their pocketbooks. Great Britain was vested in expanding their interests elsewhere, and battling other people to subject them to the English way of life and providing new roads to commerce. In order to do so, they had to pull their manpower and resources from the American Colonies in order to subject other countries that were not so naturally docile. This all took place over many years, so that by the time the British Government returned to consider their foundling colonies, the Americans had created a going illegal concern in the rum trade and slavery. It is what has come to be known as the infamous Rum Triangle[i], What then happened was England began to be more troubled by the news coming out of their American Colonies. Suddenly, English men that had settled in the American Colonies were treated as less than English men, and that was something many colonists would not tolerate. Plus, there were taxes laid upon taxes on all goods, and the colonies could not export or import from any other nation than Great Britain. That would definitely make the bristles stand up on the back of any English man’s neck. That was what all the fuss was about with the Boston Tea Party, with English tea being poured into the bay. For centuries after, and I heard not so many decades ago, there is still the tinge of tea upon the rocks in Boston Bay. The British Government began to bring to bear their military upon the rebellious colonists. It was not long before the “shot heard round the world[ii]” was fired, and the American Revolution began. This, generally speaking, was the timbre of the times in New England and the Southern Colonies. But what does all of this have to do with the Magna Carta? Everything! Many people who journeyed to the New World were descendants of the Kings and Queens of Europe, and most, if not all, descended from Charlemagne. And many people who came were looking for a different way of life – not necessarily the kind of life they had once lived in Britain and Europe. It was the moment the Founding Fathers[iii], took to write a whole new venue for living. That was the birth of the Declaration of Independence, the grandchild of the Magna Carta. Amongst those forebears to first arrive on these shores are those that are called Gateway Ancestors in genealogical circles. 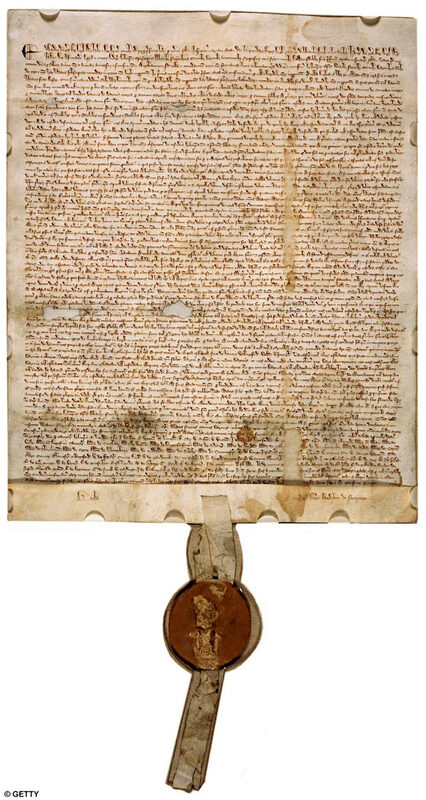 There are over some 200 names of people descended from the Magna Carta Surety Barons and they are listed in such titles as Magna Carta Ancestry, Royal Ancestry: A Study in Colonial and Medieval Families, Vols. I – V, and The Royal Descents of 600 Immigrants. These Gateway Ancestors, together with their lineage, are the focus of the Magna Carta Project; and everyone is welcome to come to see what the Project is creating ahead of the 800th Anniversary of the Magna Carta coming June 2015. [i] The Rum Triangle was based in sugar, which was plentiful in the New World, and was the link in the infamous trade between Europe, the Americas and Africa of rum and slaves, Rum is the product made from molasses, which is a by-made from sugar. It was the American Colonies, a sort of forerunner of moonshine produced during Prohibition, and if illegally produced is still illegal. Source URL: http://www1.american.edu/ted/RUM.HTM [ii] shot heard round the world: http://en.wikipedia.org/wiki/Shot_heard_round_the_world [iii] See the 1776 Project at WikiTree.